You read that right: a FREE JUKI machine… and we’re doing it this weekend! Why have the sewing gods smiled down upon you? Well, DadSews launched in February 2016. As we approach our 1st birthday, we noticed we were about to hit 1,000 subscribers in our first year! 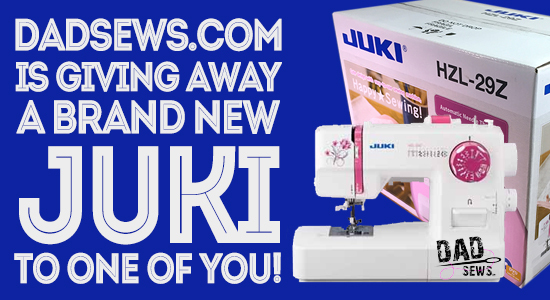 This is VERY exciting news, and I thought, what better way to say “Thank-You” to all our wonderful viewers than to give away a JUKI machine, from our friends at FabricHut.com. 36 Responses to DadSews is Giving Away a Brand New JUKI Sewing Machine! Thank You Christian, and Thank you Fabric Hut for being so Awesome! This give away is INCREDIBLE!!!! Thanks!!!!! Awesome give Away. Great for beginners and experienced craft person. Also encourages people to start sewing. Already followed on Facebook and just shared and subscribed. Great contest! Thanks! Thanks…sorry…I never did figure out Twitter. I do all the above requested bits and I just shared. Hope it brings in more subscribers. Thanks so much! What an amazing giveaway! Would love to try this machine. You are the greatest! Why, you may ask? Because you share not only your sewing successes, but also your epic failures. With humor. Not always easy to find humor in sewing failures, but you do. Aw, thanks so much for the kind words Ruth! I hope To learn to sew I dont have a machine and no one to teach me but I would love to learn!! I can teach you… at least get you going! Start from the beginning at YouTube.com/DadSews. I JUST started sewing a year ago. Thank you so much for the opportunity! This would give me a Kickstart to my sewing journey! Already liked but now subscribed & also shared post. Thanks! Completed, love Fabric Hut, purchased my Juki serger from them last year. Thank you SEW. Hope I win the prize. Fingers crossed! Love your videos!! I hope to win!! Great giveaway!! Nice contest, good pages, liked and shared. I’m teaching my granddaughter and her friends to sew! It would be wonderful to have a second machine. I love Juki machines they are the best. I would love to have one I could teach my son to use he likes to help me. Wow! A Juki! Thanks for the chance to win! I saw you on Virginia this Morning and it looked like you were having so much fun! Thanks for this give away ☺️.